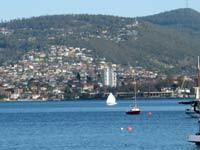 The river running through the city of Hobart, Tasmania is one of the most beautiful small boat cruising grounds anywhere. There is enough civilisation to ensure access and facilities, stunning scenery, long sheltered reaches and a huge estuary sheltered by a chain of islands from one direction and behind the river is a range of mountains that drops much of the rain out helping to improve the sunshine hours in the Aussie states temperate climate. 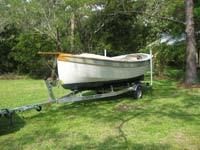 Rogue is intended as a sailing boat that will row or outboard motor fairly well so she has long slim lines as this shot shows. Graeme has her all ready to paint here, the taped chine and filled seams will not show at all when covered. There is a lot of room in here, the side seats and forward seat have buoyancy tanks under them which can also be used for dry stowage. He’s done a nice job, there is a little finishing work still to do before the paintbrush comes out but you can tell she’ll be something to be proud of. Nice, that cockpit is going to be a comfortable place. 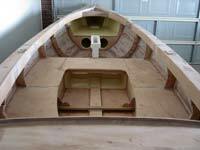 The side decks are additional to the plans, I built my own one like that and if the boat is to be primarily used as a sailing boat they are a good idea. I have no doubt that it was driving on the roads along the riverside that seduced Graeme Denne and convinced him that he should be out there enjoying the sailing, and am complimented that he chose to build my Rogue design. It took him about 18 months to build which an easy pace of building for this 14 footer, and as a novice builder he’s not only built her in good time but has made a nice job while doing so. 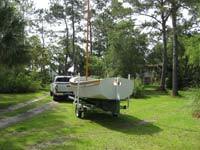 That’s a big powerful sail for a light boat, Rogues sail very well and can provide very exciting sailing as well as leisurely cruising when reefed down. Launching day is a special day for any home boatbuilder, and I’m sure that Graeme had a real grin on his face when his boat got wet for the first time. Doesn’t she look good! Just a white dot out on the water, funny how people will pay moonbeams for a view of the water but for a few hours a week and some plywood and glue, you can be part of that so expensive view. Good sailing Graeme, nice work. 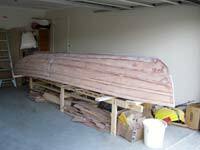 He’s generously sent me photos, some of the boat while being built in his garage workshop, and some of the boat launched and sailing. Lovely, I wonder what he’s going to do when in a few months he begins to miss the gentle work out in the “boatshop”. The next one of course will benefit from all the skills he’s learned on this one. 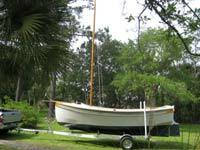 Well done Graeme, lets hear about the sailing when the Southern Summer begins. George, (Chip) Matthews has been busy over the winter and has his nice looking "Pilgrim" out of the workshop, we've seen the intside of this roomy boat, when he moved her outside he was able to take pics from a little distance away so we can see what she looks like from outside. Note that sitting up on the trailer like that makes her seem slightly high sided, once in the water she'll look more in proportion. Nice job Chip, we're all looking forward to hearing about launching day and seeing pics of her in the water. 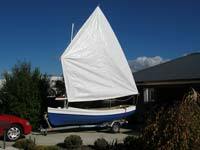 Pleased to report SCAMP not only floats, but she sails like a dream. 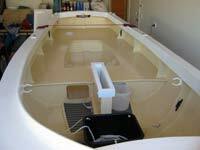 We launched today around 15:00 and SCAMP floated free of her temporary trailer and immediately found a balanced trim. She sat high in the water with no ballast, gear or crew aboard. Two of us climbed aboard with SCAMP tugging at her painter. Winds were very light so we decided to go sans ballast and with all 100 sq ft showing. After a few strokes with the oars (she rows surprisingly well-even with two aboard) we set the balanced lug and were off. As expected the rig was a fantastic and so simple to keep happy. A little downhaul adjustment here and there would clear up any wrinkles quickly. We were also pleased with a few of the extra lines we rigged (a topping lift/lazy jack and some others)-the result being a sail that can be raised and lowered with the sail and both spars captured at both ends and off the decks. Very smooth. The ergonomics aboard the little yacht are truly remarkable. Lots of room in the cockpit, but everything falls easily to hand. Seating is comfortable, and two people don't bang knees like they would on a lot of bigger boats. The "veranda" served its purposes well. As the sun was dropping and it started to cool off, I slid forward with my legs under and body against the veranda and I felt totally out of the wind but still right in the action. When I opened the stowage cabin locker to bring out some of my electronics, I didn't even have to think about them being exposed to the elements. Under sail she seemed to point well but we didn't try for any measurements. Will take a closer look when we get some wind. Wind was right off the beach and we were able to sail all the way back even in the light air. If our quick assumption was accurate, SCAMP's lug is on its "compromised" side, with the sail pushing into the mast, on the same tack where the board is on what would be its "best" side. There seemed to be only a minor difference on tacks, and the "good" sail shape tack seemed to be a bit faster. One of the most heard comments was how she looked like a much bigger boat out there. And she felt bigger too. It's only when we both intentionally sat to leeward that I remembered this isn't a 1,000 pound boat, it's a 350 pound boat. And I think filling the 175 pounds of water ballast will have her feeling like an icebreaker. 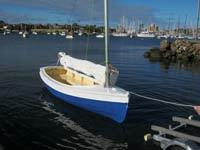 You might be able to see from the photos that she rode a little high today without gear or ballast-as she should have. The blue bottom paint comes up two inches over her theoretical loaded waterline I'm told. We're looking forward to some better wind and a chance to fill the tank. We'd planned to do it anyway today but ran out of time having fun out there. Come on over for a chat.